And speaking of vast improvements, here’s the street bumper that i hit back in January as viewed from the west in its new position. You can see that the left bolt that would be holding it to the street is sticking up three inches. 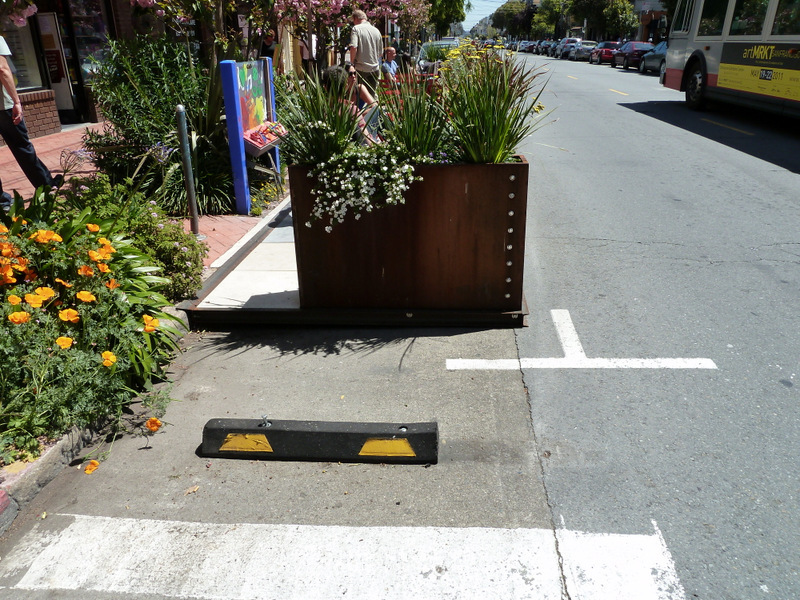 Now look closely at the right end and you can see that the bumper has been rotated 180 degrees around the right bolt so that it no longer sticks out into the street a foot beyond the plane of the planters. If you look closely, you can see the faint outline where it formerly rested and even the little round hole in the street where what is now the left bolt used to fit. I swear i had nothing to do with the repositioning, but my guess is that enough people hit this thing that one of ’em finally took matters into his own hands. Note how what is now the left end of the bumper is rounded from multiple impacts, one of them mine, when it was sticking into the street.